Welcome to the latest edition of 24 Frames. Andrew Jamieson will be guiding you through the exciting, confusing and often brilliant world of 'film'. Expect news, trailers and plenty of opinion. In 2006, Alfonso Cuarón directed the superb Clive Owen-helmed movie Children of Men, in which a dystopian future was beautifully illustrated by Cuarón's visceral style; effortlessly moulded with religious and political subtexts throughout. While the aforementioned movie was fairly nuanced in the presentation of its themes and contextual points, Gravity is not. In this movie George Clooney and Sandra Bullock find themselves stranded in space as an orbital mission goes terrifyingly wrong. To me, what was most interesting about the movie was that it maintained the feeling of allegorical fiction amidst all of the visually stunning imagery on screen. The main plot point of the story is about being lost in space and looking down on the world below, but the narrative drive of the movie is all about the desire to descend and ultimately arrive home on earth. This helps to form a paradoxically prosaic metaphor that rings true at the core of the movie. The central character has lost her daughter and has clearly looked to space exploration as a means to escape the perils she left behind on earth; she seeks the oppositional tranquillity of an inhumane environment to vacate the toil and emotion left at home. 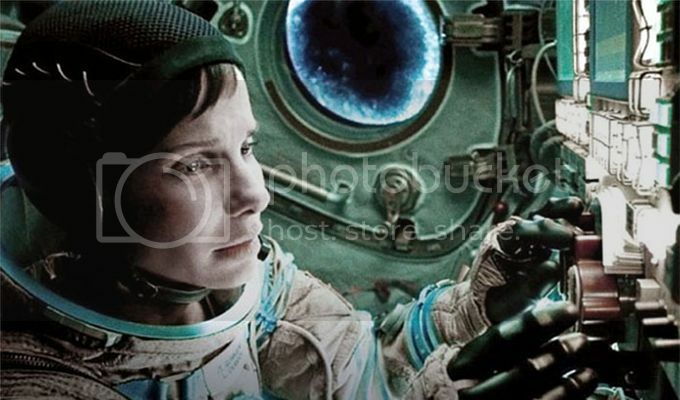 If the journey home is to begin, then the character played by Sandra Bullock must fall down into the watery depths of earth prior to the explicit presentation of her eventual ascension, pulling herself up from the depths (literally) at the end of the movie. This main thematic concern helps to establish the movie as a picture which is as much about the triumph of the human spirit as it is a wonderful thriller. While it is true that the dialogue used to convey these emotions is wildly emotional and portrayed in a sentimental manner, I would argue the point that the wanton sentimentality at play here illustrates a distinct sense of the emotionality in media that comes from the continental United States. The movie is also a superb technical achievement in terms of its use of music, sound design, 3D and the presentation of its effects (a crucial part of its cinematic presentation is the 3D element and perhaps the need for an IMAX screen to enjoy all of its visual beauty.) Is this a deceptively critical caveat from me when considering its ultimate shelf life? No. Once the movie lands on a flat screen television in your home, it is the human story at the core of the narrative that will outlive the sophisticated technology used to thrill the audience. Will the effects look as grandiose at home in later months? Of course not, but the human story about rising up from a great emotional and personal defeat is something that will always resonate in parts of US popular culture - from Katy Perry's 'Roar', to perhaps the greatest movie of the year.